The Pontos collection brilliantly combines Swiss watchmaking traditions and technical mastery with modern design. It gives consistency to the passage of time within a contemporary shape, furnishing the mechanical precision it deserves. Two new models have just been added to the Pontos line this year. Equipped with self-winding mechanisms, they each in their own way illustrate the creativity of Maurice Lacroix. The Pontos S Chronographs appear more dynamic than ever before, imbuing time with a sporty, go-getting spirit. The Pontos Décentrique GMT reaffirms its place in the world through an off-center interpretation of time as it passes and crosses the world's time zones. A contemporary design that structures time itself. With its spherical dial creating a sense of nobility and architectural case housing a perfectly controlled mechanism the Pontos GMT Décentrique has an undeniable style. The Pontos "décentrique" range sought from the outset to break with traditional watchmaking and make a difference. That difference is now beyond question. A worthy descendant of the Pontos GMT Décentrique launched in 2006 and itself earning the supreme distinction of the Red Dot Design Award in 2007, the new dual-time zone timepiece showcases the off-center concept so dear to Maurice Lacroix. Simplified and flattened compared to its 2007 counterpart, the new face of the Pontos GMT Décentrique is no less audacious. The eccentric contrast with the sunburst finish unsettles our sense of architectural rigor. Jubilantly freed from conventions, time runs riot, drawing the eye now to 10 o'clock, now to 4 or 6, depending on the information sought. The constant interplay of movement showcases the hours, minutes and seconds at 10 o'clock on a dial graced with radiant appliqué index markers. 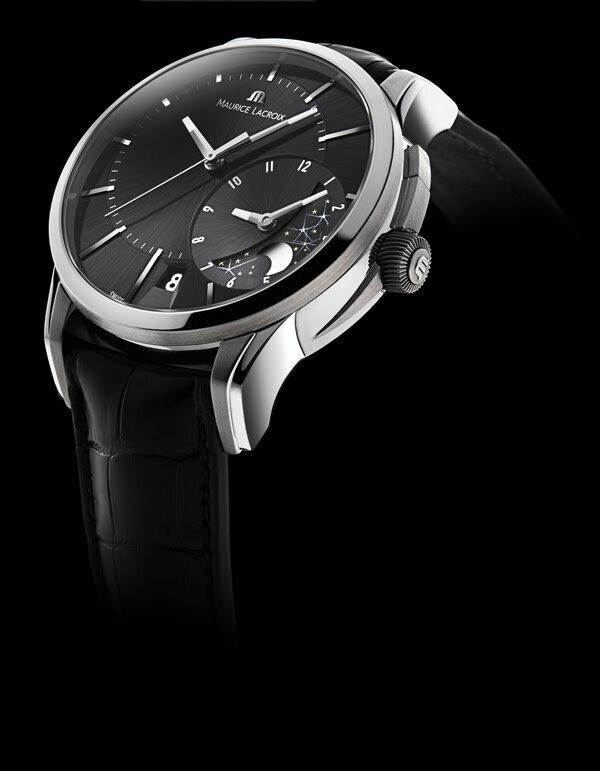 Opposite, at 4 o'clock, a contemporary day and night disk clarifies the GMT display, accented by luminescent-tipped hands. Finally, at 6 o'clock, the calendar appears in a window, without impacting on the general readability. A 43 mm diameter case serves as the setting for the self-winding ML 121 mechanical movement. Hewn in steel, it embodies the perfect balance between architectonic design and the expertise Maurice Lacroix brings to its watchmaking complications. Visually fascinating and mechanically outstanding, the new Pontos Décentrique GMT is dedicated to all modern-day travelers seeking of total mastery over time and all who love to feel the world at their fingertips.